I’m not sure how the years have been for you. You loved it all through? Were there sometimes you prayed and it seemed not to be working? Some experiences you hope never to have again? The picture of a wave comes to mind. Moving from one point to the other, it never does so in a straight line. While it approaches its destination, there are ups and downs. Sometimes from its highest points called the crest, it sinks to its lowest point called the trough. The most important part however, is that point where it reaches its destination despite all. 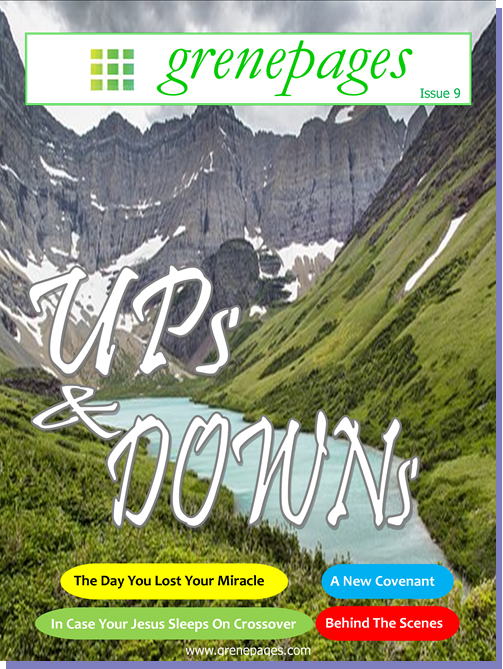 In this 9th edition of grenepages, we share the mind of the psalmist. In the journey of life, there are troughs as much as there are crests. Things will not always go as planned. Do not let your soul be worried. You shall praise him again. This entry was posted in grenepages and tagged editorial, issue 9. Bookmark the permalink.